The new school year is rapidly approaching. Parents are considering all of the best ways to keep their children healthy during the school year. Every parent wants their child to be able to learn. They want their child to focus and study to the best of their ability. They want to help their child avoid getting the inevitable sicknesses that travel throughout the schools at times. Parents must also consider helping their child avoid the pains that may come from carrying around those overweight backpacks. Studies done by the U.S. Consumer Product Safety show that backpack-related injuries sent more than 7,000 people to the emergency room in just one year. And yet another study done in Italy found that the average child carries a backpack that would be equivalent to a 39-pound burden for 176-pound man, or a 29 pound load for a 132-pound woman. Of those children carrying heavy backpacks to school, 60 percent experienced back pain as a result. That being said, we can see that backpack safety is a concern for the children who carry these overwhelming loads of books on their backs. So, here’s the question, How can we ease the load and make it so there are fewer backpack-related injuries this year? 1. Don’t let the backpack get too heavy. Check the weight of your child’s backpack and make sure it is no more than 5 to 10 percent of his or her body weight. A heavier backpack will cause the child to bend forward to try to support the weight on his or her back, rather than on the shoulders, by the straps. If the backpack is still too heavy, talk to your child’s teacher and ask if the heavier books could be left at school and only bring home the lighter handout materials or workbooks. Most backpacks have adjustable straps, so make sure that the straps are adjusted properly, helping the backpack fit to your child’s body better. If the straps are too loose, it can cause the backpack to dangle uncomfortably which can lead to spinal misalignments and pain. The backpack should never hang more than 4 inches below the waistline. A backpack that hangs too low can cause your child to lean forward when walking. Strongly advise your children to wear both shoulder straps. 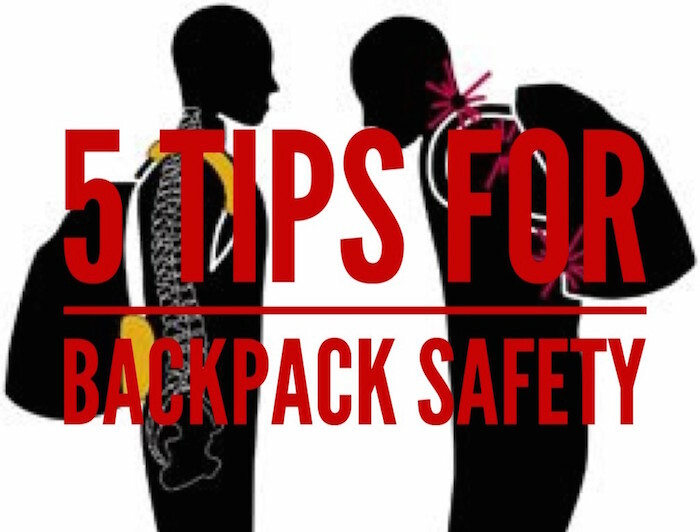 Carrying around the backpack just on one shoulder will cause the disproportionate shift of weight on one side, leading to neck and muscle spasms, along with low back pain. 4. Load the backpack correctly. When loading the backpack make sure that the heaviest items are placed on the bottom and the lighter ones on top. This will make it so the bag is more balanced and will be easier for your child to carry. Also, make good use of the different compartments that come in most backpacks to effectively distribute the weight. 5. Use the “belt” strap. Most backpacks come with a strap that buckles around the waist (some even around the chest as well). If the backpack has either of these straps, it is important for your child to use them. They will make the bag much stronger, supportive and comfortable. Also, all of the weight of the bag will not be supported by just the shoulders; your child will be using their core as well, which will cause less pain in the back and neck. Backpack safety is very important for children so they can put their focus on learning, not on their back or neck pain from carrying around all of those heavy books. If you child is experiencing back-pain, headaches, muscle spasms, inability to focus, frequent illnesses, or other ailments, be sure to bring them in to have them examined by Dr. Zyrowski at Eximius Chiropractic. He will be able to detect if your child has any Neuro-Structural Shifts, the most common cause of such complaints. You can call (586) 263-1376 to schedule your complimentary consultation, which is simply a conversation, not a commitment.